Paradox 4 DOS | The home for all things Paradox for DOS related! Simply the fastest way to run Paradox for DOS on a Windows 64-bit operating system. The underlying file system used by the dbDOS™ VM is brand new and adds significant functionality and increases the speed of the VM by as much as 38% over the prior engines. dbDOS PRO 6 comes with multiple ways of printing. In addition to printing on modern hardware, we have also included a set of retro printer drivers. 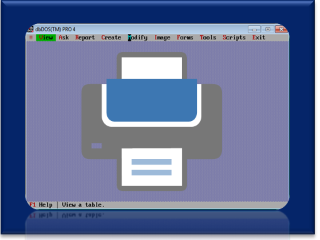 When outputting to a modern device like a printer, there is an option for the output to be to a PDF file. This option allows for printing only to PDF or printing to PDF and the selected Printer at the same time. 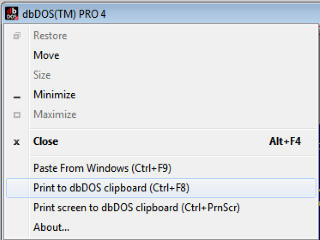 You can copy text from a Windows application using the CTRL-C and paste that text into the dbDOS™ system by pressing Ctrl-F9 or clicking the dbDOS™ PRO 6 VM System menu as shown above and selecting the paste option from the menu. dbDOS™ PRO 6 adds a new capability to copy from the dbDOS™ PRO 6 environment to the Windows environment. The system accomplishes this task by capturing any output to the printer in a windows buffer and allowing users to copy from the popup window into the Windows OS. dbDOS™ PRO 6 is unique from any other DOS based emulation. The underlying engine is both a Virtual Machine (VM) and an emulator to give the best of both worlds and a great out-of-the-box experience. In the old DOS based programs, there was the ability to print the screen contents to a printer. 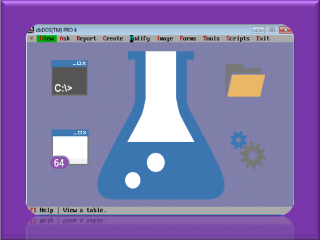 Pressing the Ctrl-PrtScr button or clicking the dbDOS™ PRO 6’s System menu option that will take a screen shot of the current screen and send it to a printer or clipboard for further processing. dbDOS™ PRO 6 allows for setting the screen size to best fit your existing monitors and display cards. dbDOS™ can also support full-screen mode, however the product gives you the flexibility to work at your desired resolution. 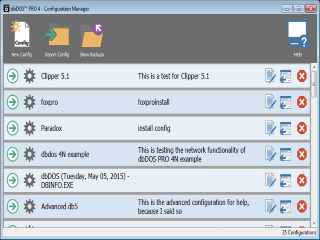 dbDOS™ PRO 6’s Configuration Manager makes it simple to manage complex DOS configurations in an easy step-by-step Wizard. The Configuration Manager allows end-users to manage the Windows shortcuts and idiosyncrasies of the specific settings per DOS product. 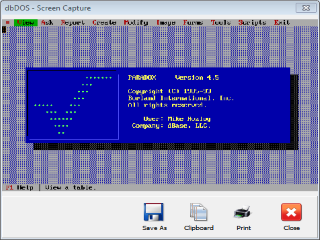 dbDOS™ PRO 6 can run practically any DOS based program. This includes your favorite games, databases (Paradox, dBASE, FoxPro, etc), and office software (Lotus 123, Word Perfect, WordStar, etc). dbDOS™ PRO 6 comes with everything you need; the ability to change screen resolutions, printers, and different formats all at one low price. No need for any other software, just dbDOS™ PRO 5+N and the DOS based software you want to run and use. 1000s of users from around the world! Users from around the world already use dbDOS™ for their DOS based dBASE programs, applications, and data… it works the same for Paradox! 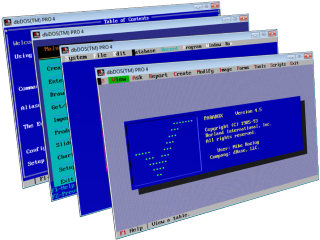 All you need is dbDOS™ PRO 6 and a copy of Paradox for DOS and you are ready to go! Don't delay, get started right now!